A bunion commonly occurs when the big toe is angled towards the second toe. It occurs as a birth defect or in people suffering from arthritis, or from unhealthy shoe-wearing habits. The skin covering the affected joint becomes thickened, inflamed and painful. Blisters can also appear on the affected region. Over time the condition can get really worse with the bunion becoming big and making it difficult to even walk normally. Bunions are more common in women than in men. A simple way to manage a bunion is by wearing shoes that are slightly larger than your normal size. A comfortable shoe will avoid pressure on the bunion and will provide enough room for the toes. It is recommended that you avoid wearing high heels, shoes made of leather and shoes that have seams that can rub onto your bunion. 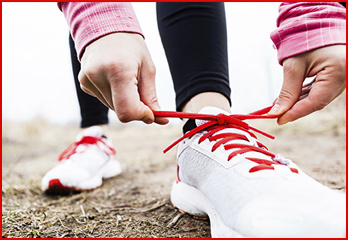 Wearing synthetic shoes may increase the appearance of blisters because of excessive sweating. A hot compress helps by increasing the blood circulation in the affected area and reducing pain and inflammation. Hot compress can be applied by placing a readymade heating pad on the affected area. You can also apply a moist hot compress to the affected area by using a towel dipped in hot water. You can repeat the process several times in a day until you get relief. A cold compress helps by numbing the nerve endings and constricting the blood vessels in your foot, thereby, providing pain relief. You can prepare a cold compress by crushing ice and wrapping it in a cloth. Place the compress on the foot for 5-10 minutes. Repeat the process 2-3 times, giving a break of 10 minutes in between. How to get rid of bunions? Massage will improve the blood circulation in the area, thereby, providing relief from symptoms. You can massage the area with olive oil, castor oil or coconut oil for 10 minutes. Repeat the process 2-3 times every day. You can also approach a professional massage therapist for more effective results. A regular massage can slow down the bunion formation and can even remove it completely. Soaking your bunion affected feet in Epsom salt water provides pain relief especially if you are suffering from arthritis induced bunion. Soaking in Epsom salt containing water may also help treat your corns and calluses. This can be prepared by adding a handful of Epsom salt to a container containing warm water. Place your feet in the container until the water becomes cool. Dry your feet and massage with olive oil or coconut oil. You can repeat the procedure three times per week. How to get rid of bunions? The anti-inflammatory properties of turmeric are effective in treating bunions. You can use turmeric by either applying it topically or consuming it orally. To prepare turmeric for topical use mix ½ teaspoon of turmeric with olive oil. You should apply this paste directly on the bunion 2-3 times every day. Turmeric can be taken orally by mixing one teaspoon of turmeric with water or milk. You should drink this preparation twice daily to get relief from symptoms. Chamomile has anti-inflammatory properties that improve pain and inflammation associated with bunions. You can brew a cup of chamomile tea and drink it every day. You can also place a used chamomile tea bag on the bunion 2-3 times every day. This may not only provide pain relief but also shrink the bunion. Moreover, rubbing chamomile essential oil on the affected area of your feet can improve the alignment of your toe. Red pepper or cayenne pepper contains a compound called capsaicin, which helps in relieving the inflammation and pain associated with bunions. You can directly rub a piece of sliced pepper onto your bunion. It may irritate your skin, so try it on a small area initially to find whether you can tolerate its effects. Multiple capsaicin containing creams are available in the market. You can apply these creams on the bunion for pain relief. How to get rid of bunions? The anti-inflammatory properties of calendula are highly effective in relieving pain caused due to bunions. Massaging calendula oil on the affected area provides pain relief. Calendula ointments are also available in the market, which can be applied topically on the affected area of the skin. 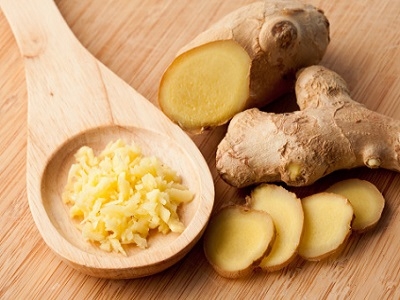 Ginger has anti-inflammatory properties that provide pain relief and help shrink bunions. It also makes the affected skin soft and smooth. You can massage ginger oil on the affected area of your skin for 15 minutes every day for symptom relief. Multiple types of splints and braces are available in the market that provides pain relief from bunions and realigns your toe. Splints and braces for bunions may not provide complete and immediate cure. However, they may relieve pain and provide long term benefits. They reduce pressure on the bunion and inflammation associated with it. Use an ice pack before and after using a splint to reduce inflammation. On-the-counter painkillers such as paracetamol or ibuprofen can be used to provide pain relief. You can approach your doctor if the pain due to bunions is severe. Your doctor may also prescribe antibiotics if the skin over your bunion is inflamed and infected. How to get rid of bunions? Foot exercises help relieve pain, discomfort and stiffness. Some such foot exercises are picking marbles and placing them on a dish, stretching your toes for 10 seconds and then curling them in for 10 seconds, rolling a tennis ball under your foot and aligning your big toe with your foot for 10 seconds and then releasing it. Regular practice of these exercises will provide symptom relief. If your bunion has been causing pain for over a year then your podiatrist may suggest surgery. Surgery is usually advised when all other options have failed to provide pain relief. It is also recommended when your bunion is causing associated problems such as hammertoes and bursitis or if you have a bunion located in the region of your little toes. Surgery completely removes your bunion and provides pain relief.